7QP is an amateur radio contest, held annually on the first Saturday in May. 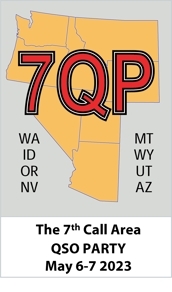 The stations of the US 7th call area (Arizona, Idaho, Montana, Nevada, Oregon, Utah, Washington, Wyoming) become "the pursued", and the rest of the US, Canada, and the world tries to work as many of us, on as many bands/modes as possible, over an 18-hour period commencing at 6:00am Pacific Time (1300 UTC). In the 2015 7QP, nearly 1200 stations in the 7th call area participated, and more than 6500 stations from elsewhere, including stations from more than 80 countries. 7QP was originally organized by the Central Oregon DX Club (CODXC), based in Bend, Oregon. 7QP replaced the "Oregon QSO Party" (OQP), which been had been run by CODXC for several years. OQP had about as much activity as one would expect for a single-state QSO party for a sparsely populated state. In the last year of the OQP (2005) about 150 stations from Oregon participated -- at any level of participation. The contest lasted 12 hours, it was not a particularly busy 12 hours, and it took a lot of effort on our part to achieve that level of participation (2005 OQP Results). After several years of effort with little to show for it, we were motivated to come up with something bigger than our little contest. It seemed to us that our 7th-area neighbors (other than Washington, possibly) might want to join in. K4XU floated this idea past the leader of the Washington Salmon Run (and the ARRL Contest Manager at the time) Ward, N0AX, at the NW DX convention in August 2004. Since the proposed date for the event was half a year removed from the Salmon Run, Ward thought it was a great idea. He noted that major contest club representatives from most of the W7 states were also at the convention. We rounded them up and had an impromptu meeting right there in the lobby of the hotel. The first decision made was that the contest would be held on the first Saturday in May. That also happened to be the same day that the Indiana and New England QSO Parties were traditionally staged. The reps included K8IA from AZ, K7BG from MT, K5RC from NV, K7UT from UT, W7SE from WY, W7QC from WA, and K4XU from OR. K7TQ later signed on for ID. They became the state 'captains' who agreed to promote the 7QP within their state. K5RC was the first 7QP chairman. Tom's extensive experience in running the Texas Armadillo Run was invaluable in getting us off the ground and marketing the contest to relevant constituencies. K4XU and the Central Oregon DX Club agreed to be the overall sponsor of the event and would draft rules for approval by the group. We knew that if we were going to coexist with the Indiana and New England parties running on the same weekend, we needed a compatible exchange format. We dropped OQP's serial number and restored the obligatory 5NN. Some debate remained on state/county designators - we decided to use state first followed by three-character county codes. The first running of 7QP in May of 2006 was a success; we had achieved critical mass immediately. Almost 300 logs were submitted (the high-water mark for OQP had been about 80), and it was possible to keep busy the entire 18 hours of the contest! The feedback from participants, including many veteran contesters, was very positive -- see the "2006 Soapbox" tab on this page. Computer logging support became more important each year, both for participants and for our log-checking and scoring. K3CT was very helpful in providing 7QP support in N1MM. The other programs followed suit. K3CT was also inventive. Since most logging programs can only do one contest at a time, anyone trying to do all three has a difficult time switching between logs. His solution: the IN7QPNE -- all three rolled into one 'contest'. To help promote this, the sponsors of all three parties agreed that since each had log checking software capable of determining which QSOs in a log counted for its contest, the entrant could submit the same log to all three sponsors. This feature has allowed 7QP to quickly become one of the top two QSO parties. For the 2015 edition of 7QP almost 600 logs were submitted. 7QP's organization structure includes state captains and lieutenants who serve on a decision-making steering committee, plus have responsibility for publicity, promoting mobile/county operations, and coordination with local clubs in their states. For the stations outside of the 7th call area, the overall number of counties worked is the score "multiplier", giving those operators a large incentive to seek out and work as many counties as possible. For the organizers of 7QP, a key objective is to get as many of the 259 counties in these eight states activated for at least some of the contest by promoting serious "roving" mobile operation and county-line stations, plus arm-twisting the casual-operator fixed stations in under-populated counties. The challenge is that the 7th call area includes many of the most sparsely populated counties of the United States! County size and highway accessibility is a challenge to activating a lot of counties via mobiles. Weather can also be a challenge in the northern states at higher elevations in early May. We've been partially successful in our efforts to activate counties. Despite our best efforts, we've never had more than 209 counties activated in any single 7QP, and there are still some counties that have never been active. So we still have plenty of room to grow and expand the contest.